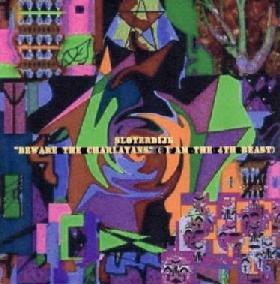 Sloterdijk - "Beware The Charlatans (I Am The 4th Beast)"
Sloterdijk - "Beware The Charlatan (I Am The 4th Beast)"
Sloterdijk, a project headed up by Mike Burro plus whoever else happens to be part of the band at any given time, is one of the few American bands playing heavy Hawkwind inspired Space Rock. So any new release is a welcome offering to the space community at large. Space fans will be pleased to know that the music on Beware The Charlatan is characterized by dark atmospheres, pounding heavy metallic rhythms, wailing psych guitars, and symphonic keyboard backdrops, played with intensity and passion. "Circle Of Eternity" and "Free The Gnome" are both pounding metallic space rockers with trippy freak guitars against a dark symphonic backdrop. The latter has a juicy combination of free jamming guitar and keyboards, and I got a kick out of the lyrics.... "Free the gnome. The garden gnome. From your home. "...I wonder if that's an indictment against fashionable homes with gnomes in the garden? "Philosopher's Disease" is probably the heaviest song on the disc. "The Thunderbirds Live 8/6/2000" is, as the title implies, a live track, and is the most intense song on the disc, the music having a "Master Of The Universe" feel to it. "Space Love" is one of my favorite "songs" from any of Sloterdijk's albums, and I dig that old time organ sound. S-P-A-C-E LOVE!!! "Ahi-Ahi" is more purely psychedelic than most Sloterdijk songs. The tune includes a very nice acoustic guitar and organ combination, along with chanting vocals to give the music an Indian flavor. And "Flashbacks" gives center stage to bassist Rob Eckstedt and features rock music with a steady groove that provides a stage from which he reads an excerpt from Timothy Leary's autobiography, Flashbacks. What can I say? If you're hankering for pure space rock with a metallic edge from the Hawkwind school then you've come to the right place. Keyboards cover most of the rhythm section duties, but the music is sufficiently powerful that it doesn't make much of a difference for this listener. Sloterdijk's CD's could be recorded better and I hope they get into a proper studio some day, but musically this is the real deal. And Mike is aggressive about playing shows, both in the US and Europe, so your chances of catches a Sloterdijk show are relatively good. Check ‘em out. For more information and to hear sound files you can visit the Sloterdijk Mp3.com web site at: http://www.mp3.com/sloterdijk. You can email Sloterdijk at sloterdijk@msn.com.